Understanding the nature of chemical bonding in C-based materials at high pressure is receiving increasing attention as a result of the discovery of novel structures such as carbon nanotubes and graphene. X-ray inelastic scattering spectroscopy, also known as x-ray Raman spectroscopy (XRS), has emerged as a key technique for probing the interplay between sigma- and pi-type bonding in such materials. For carbon in particular, however, the scattering from the diamonds used in the diamond anvil cell (DAC) tends to overwhelm the sample signal. This problem may is addressed in the XRS technique by using a radial geometry and x-ray transparent beryllium gaskets, but this requires ample space between the diamond anvils and the sample. Although the design of the DAC itself is essentially fixed, the gasket allows much more freedom for design improvements. In recent work carried out at HPCAT, Lin Wang and co-workers from HPSynC have demonstrated the utility of a gasket made from a cubic boron nitride (c-BN)-epoxy composite. Used as an insert in a traditional beryllium gasket (Fig. 1), the c-BN-epoxy composite maintains a thickness of 80 microns as 48GPa, with 20 microns between the sample and each of the diamond anvil surfaces. With this gasket assembly, the scattering from the diamond anvils is cleanly avoided, while the scattering from the sample is maximized. This development in sampling methodology promises to significantly enhance ongoing work in the area of carbon-based nanomaterials at extreme conditions. To read the full report, go to [L. Wang et al., Rev. Sci. Instrum. 82, 073902 (2011)]. Because the synthesis of polycrystalline samples of nanomaterials typically yields a range of particle sizes, current work is focusing on the growth and characterization of nanocrystals, with sizes on the order of 100 nm. 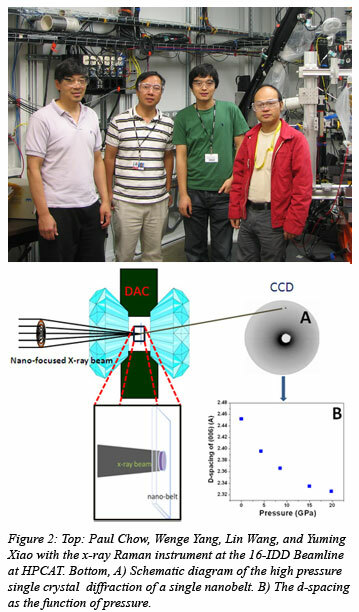 At most synchrotron facilities, however, the minimum beam size attainable is on the order of 2-5 microns, which results in a very low efficiency for diffraction measurements of nanocrystals, whereas an ideal beam size would be in the 200-600 nm range, This size of focused beam (250 nm FWHM) is provided by beamline 2-ID-D at the APS, and is suitable for both diffraction and x-ray imaging. A crystalline sample of a one-dimensional NbSe3 nanobelt was studied at pressures up to 20 GPa (Fig. 2). Taking into account the 50 nm thickness of the nanobelt crystal, and the 250 nm size of the x-ray beam, the effective diffracting volume of the sample was 2.5 x 106 nm3, which is equivalent to a sphere with a volume of 130 nm3. Diffraction patterns taken at constant 2theta, and different azimuthal angles provides data on the compression of the nanocrystal. This work represents the first time that a nanofocused synchrotron x-ray beam has been used to study nanoscale single crystals at high pressure, and sheds light on future studies of nanocrystals with large grain size distribution under both high pressures and ambient conditions. For more on this new technical development, see [L. Wang et al., Rev. Sci. Instrum. 82, 043903 (2011)].